Born in 2003 with the arrival of the Vespa GT 125 and 200, the family of the big Vespa subsequently evolved, starting from 2005, with the arrival of the GTS version and displacements up to 300 cc. Big, comfortable, accommodating and amazingly protective, the Vespa GTS combines its elegantly urban and city soul with the vocation to travel and tourism that the big Vespas have always embodied. From the GS of 1955 to the PX 200 of 1978, not forgetting the Vespa Rally of 1968, the biggest Vespas have always combined great performance and comfort, even on longer and more challenging journeys. Now the Vespa GTS reiterates its state-of-the-art technology with the adoption of the most advanced and technological electronic riding aid systems. With this, Vespa confirms its cutting-edge technology which has always marked its history and makes it one of the most modern, advanced and safe vehicles on the road today. The most sporting Vespa range ever evolves and hits new standards of safety, technology, comfort and painstaking attention to detail. The Vespa large body version, timeless two-wheeler icon, long ago elected as ambassador of Italian design worldwide, now has a new and larger helmet compartment, a more comfortable saddle and latest generation instrumentation. Now available on the Vespa GTS is the sophisticated Multimedia Platform that allows smartphone connection to the on-board electronic system to transform it into a multi-function tool, a full-fledged complex computer able to simultaneously display information such as tachometer, rev meter, and also instantaneous engine power and torque, longitudinal acceleration, instant and average fuel consumption, average speed and battery voltage and much more. The smartphone connected to the Vespa Multimedia Platform also makes it possible to display maps and routes as well as identify petrol stations and Service Stations. The tyre status control function (only available for the ABS/ASR versions) synergically exploits the vehicle’s sensors and the smartphone to monitor wear and inflation of the tyres, warning the user immediately before any potentially critical situations can arise; while the general analysis function allows overall vehicle condition check. The evolution of the Vespa GTS follows tradition, retaining that magical balance between the sporty and modern lines of the body, strictly in steel, and refers to the Vespa tradition, capable of gaining the consent of a truly cross-sectional and heterogeneous audience at all latitudes. The new Vespa GTS and Vespa GTS Super range preserves the distinctive characteristic of the large body Vespa but has many important aesthetic updates established by the Centro Stile Piaggio Group, the atelier situated in the historic plant in Pontedera from which the Vespa shapes have always emerged, including also the fine Vespa 946, the elegant Vespa Primavera and the young-looking Vespa Sprint. The new Vespa GTS and Vespa GTS Super range benefits precisely from the analysis and research carried out on latest generation Vespas, introducing stylistic innovations of great quality. Vespa GTS and Vespa GTS Super acquire a tie on the front shield with a more modern design, in keeping with that of recent Vespa Primavera, front and rear turn lights characterised by new transparent coverings and by an all-new rear light cluster that is finely enhanced by a chrome frame that echoes the finish of the crest on the front mudguard and, on the Vespa GTS, the chrome finish of the extremely convenient rear luggage rack, an explicit reference to the Vespas of the 60s. 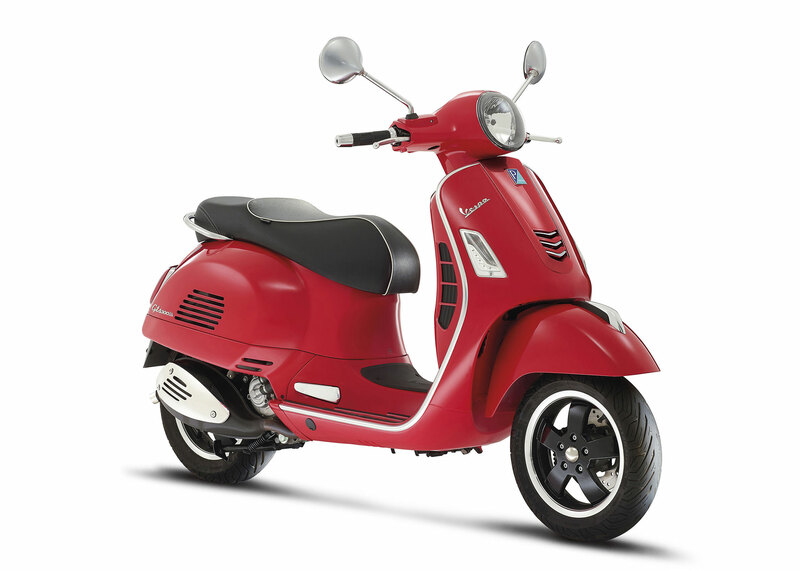 In addition to a range of dedicated colours, the Vespa GTS Super has several specific details, such as the five-spoke wheel rims with the new black finish, a different moulding on the front mudguard, the differently-styled tie on the front shield and of course the red front suspension spring, according to tradition. On both versions of the Vespa GTS, the cover of the central tunnel of the footrest, enhanced with the Vespa logo, is new. The modern and decisive lines of the hoods, the round and sloping headlight and the extractable passenger footrests are characteristics that remain intact on the Vespas of the new GTS series, making them as always unique. The perfect ergonomics and the natural seat position have always contributed to making every Vespa comfortable, pleasant to ride and accessible to all. The new Vespa GTS and Vespa GTS Super saddle offers superior comfort thanks to the new padding and different upholstery. 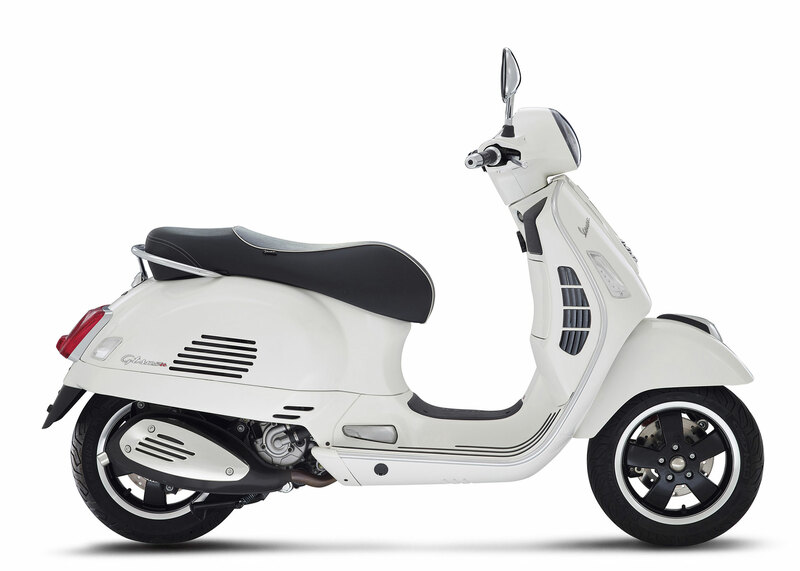 The saddle of the Vespa GTS Super also has white edging , another clear reference to the sports saddles of the Vespa tradition. The under-saddle compartment has been completely redesigned to take full advantage of the available space, now able to accommodate two Vespa demi-jet helmets and much more. Helping increase the load capacity of the new Vespa GTS and Vespa GTS Super range is the drawer in the leg shield back plate, ideal for keeping at hand smaller items such as glasses, documents and mobile phone, and the handy bag hook, in the upper part of the leg shield back plate. On the Vespa GTS you can also count on the comfortable and solid support provided by the rear luggage rack, facilitating touring use, also guaranteed by the protectiveness of the shield and the performance of the 300 cc engine with which it is available. Standard on all models in the new Vespa GTS and Vespa GTS Super range is the USB port, situated inside the drawer in leg shield back plate, convenient for recharging any external devices, while the front turn lights contain a series of LEDs that serve as daytime running lights. The trapezoidal digital instrumentation is completely new: compact in size but with very comprehensive information, it consists of a classic speedometer and a small multifunction digital panel, surrounded by as many as six warning lights. The information provided also includes the fuel level, clock and two trip meters. The instrumentation on the Vespa GTS has a clear background and blue backlight; that of the Vespa GTS Super has a black background and is lit by a sportier shade of red. The new Vespa GTS and Vespa GTS Super range acquires compatibility with the Vespa Multimedia Platform (VMP), the innovative multimedia platform which introduces a meaning for communication on two wheels. Connecting a Smartphone with one of the most popular operating systems to the on-board electronic system, VMP transforms the latter into a true and sophisticated multifunction trip computer, capable of providing a quantity of information to the rider both regarding the vehicle status as well as the route taken. To easily keep all the riding parameters under control, thanks to the touchscreen of the smartphone, and make both metropolitan as well as longer journeys in total safety. Vespa GTS and Vespa GTS Super for the first time adopt important technical developments in the name of safety and comfort. The Piaggio Group owns the best technology currently available, thanks to the experience acquired at the highest levels by its motorcycle brands. The Piaggio Group was the first company in the world to introduce electronic systems on scooters, once only available on the best motorcycles, such as ASR and ABS, two systems for active safety, now also available for the Vespa GTS and Vespa GTS Super range. Each wheel has an rpm detection system – a sensor and a phonic wheel – that instantly measure the speed and deceleration of the same with respect to that of the vehicle. The sensors communicate with a 2-channel hydraulic control unit which activates the ABS system if one of the two wheels decelerates sharply with respect to the vehicle, preventing it from locking and guaranteeing stability and efficient braking even on surfaces with low friction coefficient. The ASR uses electronics and the ABS sensors to compare the RPM of the wheels. When the sensors sense an excessive speed of the rear compared to the front wheel, the control unit intervenes (first on the advance and then, if needed, also on the injection) to prevent skidding and avoid losing control of the vehicle. The Vespa GTS and Vespa GTS Super technical equipment also provides for the adoption of the new ESS front suspension, successfully introduced on the Vespa Primavera and Vespa Sprint. 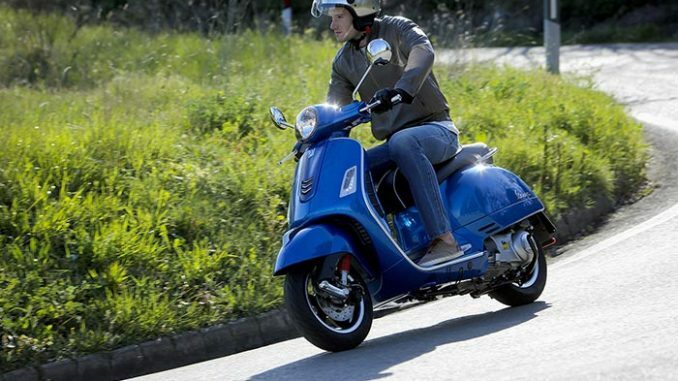 While maintaining the classic single-arm front suspension with push pin clutch, typical of Vespa tradition, the new Vespa GTS and Vespa GTS Super range adopts a completely redesigned system able to halve the sliding friction. The shock absorber is now fixed to the aluminium support that connects it to the wheel via a hinged pin, whereas previously it was fixed with two screws. Increasing the fluidity of the suspension also improves ride comfort and absorption capacity of the road imperfections, which avoids kickback to the driver, providing a perfectly smooth, relaxed and safe ride. The new Vespa GTS and Vespa GTS Super range is based on the reliable and proven technical features of the previous series. The body, as always for Vespa since 1946 to date, is made strictly of steel and provides an unequalled strength, as well as truly unique safety and dynamism. The result is a particularly brilliant ride both in city traffic as well as on country roads: an exhilarating mix of handling and reassuring stability, also thanks to the generous section tyres fitted on as large as 12 inch diameter wheel rims. The double-disc braking system ensures prompt deceleration, even in sports use, with a reserve of modularity able to put at ease even the neophytes. The Vespa GTS and Vespa GTS Super come with a 300 cc 4 valve, 4 stroke single cylinder liquid-cooled engine with electronic injection, able to provide a maximum output of 22 HP at 7,500 rpm, with maximum torque of 22.3 Nm at only 5,000 rpm. Values that ensure heightened throttle readiness and in general extremely brilliant performance, making the new larger body Vespa ideal vehicles for city roads and touring, even long range travels, in full comfort whether alone or with a passenger. 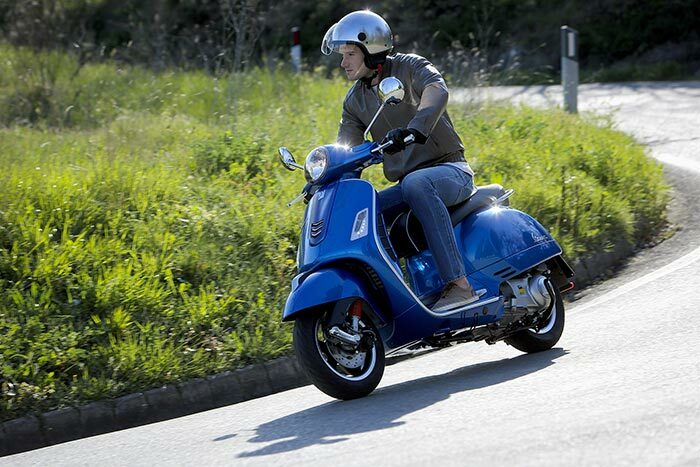 Vespa GTS Super is also available with a 125 cc engine, for those only having a standard driver’s license. Vespa made its first 125 cc engine as far back as 1948. This was the unit that powered the Vespas immortalised by the classic film Roman Holiday, ridden by Audrey Hepburn and Gregory Peck. Obviously, at over 60 years in the future, engine technology has come a long way. The 125cc single-cylinder engine that powers the new Vespa GTS Super is a modern engine with electronic fuel injection, 4-strokes, 4-valves, capable of providing an outstanding rideability while reducing maintenance costs requiring low maintenance at every 10,000 km. The new Vespa GTS and Vespa GTS Super are available with a dedicated colour range for each of the two versions. 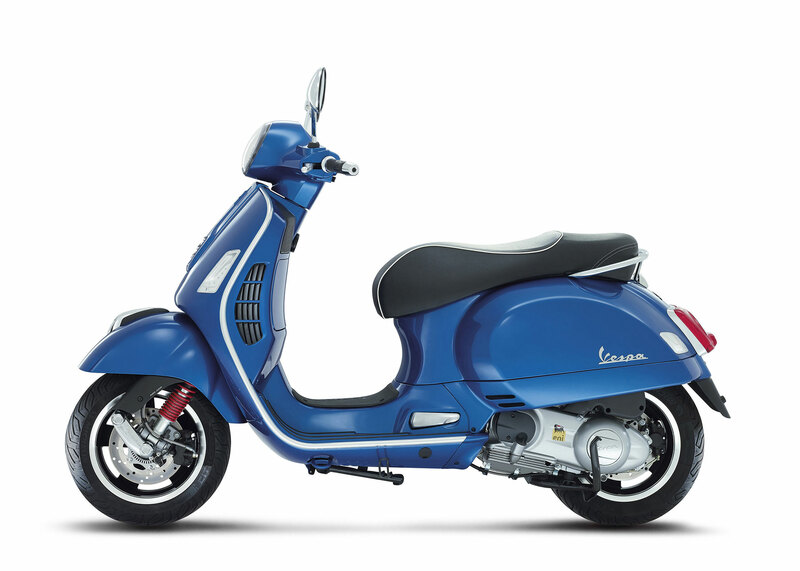 Vespa GTS 300 comes in Nero Vulcano, Blu Midnight and Grigio Dolomiti (all with a beige saddle). Vespa GTS Super 125 and 300 are available in Nero Lucido, Montebianco, Rosso Dragon and Blu Gaiola, all four with a to black saddle. As always in the Vespa tradition, also the new GTS range has a wide range of accessories to customise the vehicle and increase the level of comfort and functionality. The top box, which can accommodate a flip up helmet, is painted to march the body colour and has a padded back rest to optimise passenger comfort. The top box is designed for use on the chromed support, standard on the Vespa GTS, and available as an accessory for the sportier GTS Sport. Protection on board is guaranteed by the methacrylate impact and splinter resistant windshield and by the transparent high quality top fairing with its compact and sporty lines. The leg cover in thermal material, easy to install, offers driving comfort all year long. The accessory set also includes the mechanical anti-theft device, electronic anti-theft device, top box internal bag, luggage rack straps and elegant “Country & Leisure” plaid. New Vespa Visor 2.0 helmets. Specially designed to be housed in the new spacious under-saddle compartment of the new Vespa GTS, the Visor 2.0 helmets combine safety, convenience, style and attractive design. All Vespa Visor helmets are “Made in Italy”, have interiors finished with innovative 3D breathable fabric and are available in five sizes subdivided into two different shell sizes. The shells match the colour of the vehicle bodywork for optimal aesthetic consistency. Vespa as a way of life. Vespa is the most widespread and popular two-wheeled vehicle in the world. It is a legend built on a record of technology and elegance that has transformed it over time into the emblem of a lifestyle connected to youth and freedom. The Vespa GTS “rider” can choose from an extensive line of high quality clothing, ranging from comfortable “light” padded vests, ideal for city riding, to the more traditional high quality real leather jackets. The Vespa clothing line is completed by sweat shirts, t-shirts and wind jackets, clothing to suit any occasion. The Vespa line also includes important accessories such as Vespa Black and Bicolored Sunglasses. Front suspension Single-arm ESS (Enhanced Sliding Suspension) with coil spring and hydraulic absorber.